In accordance with Directive 2004/49/EC, common safety methods (CSMs) should be gradually introduced to ensure that a high level of safety is maintained and, when and where necessary and reasonably practicable, improved. On 12 October 2010 the Commission issued a mandate to the European Railway Agency (the ‘Agency’) in accordance with Directive 2004/49/EC to revise Commission Regulation (EC) No 352/2009 of 24 April 2009 on the adoption of a common safety method on risk evaluation and assessment as referred to in Article 6(3)(a) of Directive 2004/49/EC of the European Parliament and of the Council (2). The revision should cover the results of the analysis by the Agency under Article 9(4) of the Regulation of the overall effectiveness of the CSM for risk evaluation and assessment and experience with its application as well as further developments in the roles and the responsibilities of the assessment body referred to in Article 6 of that Regulation. The revision should also include the qualification requirements (by developing a recognition/accreditation scheme) for the assessment body according to its role in the CSM, with a view to improving clarity in order to avoid differences in application across the Member States, taking into account the interfaces with existing Union authorisation/certification procedures in the railway sector. If feasible, the revision of Regulation (EC) No 352/2009 should also cover further developments in risk acceptance criteria that could be used to assess the acceptability of a risk during explicit risk estimation and evaluation. The Agency submitted its recommendation on the revision of the CSM to the Commission, supported by an impact assessment report to address the mandate of the Commission. This Regulation is based on that Agency recommendation. In accordance with Directive 2004/49/EC the basic elements for the safety management system should include procedures and methods for carrying out risk evaluation and implementing risk control measures whenever a change in operating conditions or new material imposes new risks on the infrastructure or on operations. That basic element of the safety management system is covered by this Regulation. Article 14a(3) of Directive 2004/49/EC requires entities in charge of maintenance to establish a system of maintenance in order to ensure that the vehicles for which they are in charge of maintenance are in a safe state of running. To manage changes in equipment, procedures, organisation, staffing or interfaces, the entities in charge of maintenance should have in place risk assessment procedures. That requirement for the system of maintenance is also covered by this Regulation. As a consequence of the application of Council Directive 91/440/EEC of 29 July 1991 on the development of the Community’s railways (3) and of Article 9(2) of Directive 2004/49/EC, particular attention should be paid to risk management at the interfaces between the actors which are involved in the application of this Regulation. Article 15 of Directive 2008/57/EC of the European Parliament and of the Council of 17 June 2008 on the interoperability of the rail system within the Community (4) requires Member States to take all appropriate steps to ensure that the structural subsystems constituting the rail system may be placed in service only if they are designed, constructed and installed in such a way as to meet the essential requirements concerning them when integrated into the rail system. In particular, the Member States must check the technical compatibility of these subsystems with the railway system into which they are being integrated and the safe integration of these subsystems in accordance with the scope of this Regulation. The absence of a common approach for specifying and demonstrating compliance with safety levels and requirements of the railway system among the Member States has proved to be one of the obstacles to liberalisation of the railway market. Such a common approach should be established through this Regulation. To facilitate mutual recognition between Member States, the methods used for identifying and managing risks and the methods for demonstrating that the railway system in the territory of the Union conforms to safety requirements should be harmonised among the actors involved in the development and operation of the railway system. As a first step, it is necessary to harmonise the procedures and methods for carrying out risk evaluation and implementing control measures whenever a change in operating conditions or new material imposes new risks on the infrastructure or on operations, as referred to in point (2)(d) of Annex III to Directive 2004/49/EC. If there is no existing notified national rule for defining whether or not a change is significant for the safety in a Member State, the company or organisation in charge of implementing the change (the ‘proposer’) should initially consider the potential impact of the change in question on the safety of the railway system. If the proposed change has an impact on safety, the proposer should assess, by expert judgement, the significance of the change based on a set of criteria that should be set out in this Regulation. This assessment should lead to one of three conclusions. In the first situation the change is not considered to be significant and the proposer should implement the change by applying its own safety method. In the second situation the change is considered to be significant and the proposer should implement the change by applying this Regulation, without the need for a specific intervention of the national safety authority. In the third situation the change is considered to be significant but there are provisions at the level of the European Union which require a specific intervention of the relevant national safety authority, such as a new authorisation for placing in service of a vehicle or a revision/update of the safety certificate of a railway undertaking or a revision/update of the safety authorisation of an infrastructure manager. Whenever the railway system already in use is subject to a change, the significance of the change should also be assessed taking into account all safety-related changes affecting the same part of the system since the entry into force of this Regulation or since the last application of the risk management process set out in this Regulation, whichever is the latest. The purpose is to assess whether or not the totality of such changes amounts to a significant change requiring the full application of the CSM for risk evaluation and assessment. The risk acceptability of a significant change should be evaluated by using one or more of the following risk acceptance principles: the application of codes of practice, a comparison with similar parts of the railway system, or an explicit risk estimation. All principles have been used successfully in a number of railway applications, as well as in other transport modes and other industries. The ‘explicit risk estimation’ principle is frequently used for complex or innovative changes. The proposer should be responsible for the choice of the principle to apply. When a widely recognised code of practice is applied, it should therefore be possible to reduce the impact of applying the CSM, in accordance with the principle of proportionality. In the same way, where there are provisions at the level of the Union which require specific intervention by the national safety authority, that authority should be allowed to act as the independent assessment body in order to reduce double checking, undue costs to the industry and time to market. To report to the Commission on the effectiveness and application of this Regulation, and where applicable to make recommendations to improve it, the Agency should be able to gather relevant information from the various actors involved, including from the national safety authorities, from the certification bodies of entities in charge of maintenance of freight wagons and from other entities in charge of maintenance that do not fall within the scope of Commission Regulation (EU) No 445/2011 of 10 May 2011 on a system of certification of entities in charge of maintenance for freight wagons (5). Accreditation of an assessment body should normally be granted by the national accreditation body which has exclusive competence to assess if the assessment body meets the requirements set by harmonised standards. Regulation (EC) No 765/2008 of the European Parliament and of the Council of 9 July 2008 setting out the requirements for accreditation and market surveillance relating to the marketing of products (6) contains detailed provisions on the competence of such national accreditation bodies. Where harmonised Union legislation provides for the selection of conformity assessment bodies for its implementation, transparent accreditation, as provided for in Regulation (EC) No 765/2008, should be considered by the national public authorities throughout the Union as the preferred means of demonstrating the technical competence of those bodies. However, national authorities may consider that they possess the appropriate means to carry out this evaluation themselves. In such cases, the Member State should provide the Commission and the other Member States with all the documentary evidence necessary for verification of the competence of the recognition body it selects for implementation of the Union legislation. In order to achieve a similar level of quality and trust as expected through accreditation, the requirements and rules for the evaluation and surveillance of assessment bodies in the case of recognition should be equivalent to those used for accreditation. An independent and competent external or internal individual, organisation or entity, a national safety authority, a notified body or a body designated according to Article 17 of Directive 2008/57/EC could act as an assessment body provided it fulfils the criteria required in Annex II. Recognition of internal assessment bodies in compliance with this Regulation does not require an immediate revision of already delivered safety certificates to railway undertakings, safety authorisations to infrastructure managers and certificates to entities in charge of maintenance. Their revision can be made at the next application for renewal or update of the safety certificate, safety authorisation or certificate of the entity in charge of maintenance. In existing legislation there are no limits in the number of assessment bodies accredited or recognised in each Member State and there are no obligations to have at least one. Where the assessment body is not already designated by existing Union or national legislation, the proposer may appoint any assessment body in the Union or in a third country accredited under equivalent criteria and meeting equivalent requirements to those contained in this regulation. The Member State should be able to use accreditation or recognition or any combination of these two options. Regulation (EC) No 352/2009 has become obsolete and should therefore be replaced by this Regulation. In view of the new requirements introduced by the present Regulation in terms of accreditation and recognition of the assessment body, the implementation of this Regulation should be deferred in order to give sufficient time to the actors concerned to put in place and implement this new common approach. 1. This Regulation establishes a revised common safety method (CSM) for risk evaluation and assessment as referred to in Article 6(3)(a) of Directive 2004/49/EC. the evidence resulting from the application of a risk management process. 1. This Regulation shall apply to the proposer as defined in Article 3(11) when making any change to the railway system in a Member State. Such changes may be of a technical, operational or organisational nature. As regards organisational changes, only those changes which could impact the operational or maintenance processes shall be subjected to consideration under the rules of Article 4.
the change is considered not significant, keeping adequate documentation to justify the decision shall be sufficient. if the change is significant as set out in Article 4(2), the risk management process set out in Article 5 shall be applied within the placing in service of structural sub-systems to ensure their safe integration into an existing system, by virtue of Article 15(1) of Directive 2008/57/EC. 4. The application of this Regulation in the case referred to in paragraph 3(b) of this Article shall not lead to requirements contradictory to those laid down in the relevant TSIs. If such contradictions occur, the proposer shall inform the Member State concerned which may then decide to ask for a revision of the TSI in accordance with Article 6(2) or Article 7 of Directive 2008/57/EC or a derogation in accordance with Article 9(2) of that Directive. 5. The railway systems excluded from the scope of Directive 2004/49/EC according to its Article 2(2) are excluded from the scope of this Regulation. 6. The provisions of Regulation (EC) No 352/2009 shall continue to apply in relation to projects which are at an advanced stage of development within the meaning of Article 2(t) of Directive 2008/57/EC at the date of application of this Regulation. For the purpose of this Regulation the definitions in Article 3 of Directive 2004/49/EC apply. ‘recognition’ means an attestation by a national body other than the national accreditation body that the assessment body meets the requirements set out in Annex II to this Regulation to carry out the independent assessment activity specified in Article 6(1) and (2). 1. If there is no notified national rule for defining whether a change is significant or not in a Member State, the proposer shall consider the potential impact of the change in question on the safety of the railway system. If the proposed change has no impact on safety, the risk management process described in Article 5 need not be applied. additionality: assessment of the significance of the change taking into account all recent safety-related changes to the system under assessment and which were not judged to be significant. 3. The proposer shall keep adequate documentation to justify its decision. 1. The proposer shall be responsible for applying this Regulation, including the assessment of the significance of the change based on the criteria in Article 4, and for conducting the risk management process set out in Annex I. 2. The proposer shall ensure that risks introduced by its suppliers and its service providers, including their subcontractors, are also managed in compliance with this Regulation. To this end, the proposer may require through contractual arrangements that its suppliers and its service providers, including their subcontractors, participate in the risk management process set out in Annex I. 1. An assessment body shall carry out an independent assessment of the suitability of both the application of the risk management process as set out in Annex I and of its results. This assessment body shall meet the criteria listed in Annex II. Where the assessment body is not already designated by existing Union or national legislation, the proposer shall appoint its own assessment body at the earliest appropriate stage of the risk assessment process. conduct an assessment of the application of those safety and quality processes during the design and implementation of the significant change. Having completed its assessment in accordance with points (a), (b) and (c), the assessment body shall deliver the safety assessment report provided for in Article 15 and Annex III. any independent assessment carried out by the assessment body in accordance with this Regulation. the safety authorisation has to be revised due to substantial changes to the safety regulatory framework, as referred to in Article 11(2) of Directive 2004/49/EC. Where a significant change concerns a structural subsystem that needs an authorisation for placing in service as referred to in Article 15(1) or Article 20 of Directive 2008/57/EC, the proposer may choose the national safety authority as assessment body, where that national safety authority offers this service, unless the proposer has already given that task to a notified body in accordance with Article 18(2) of that Directive. the national safety authority under the requirement of Article 9(2). 1. When granting the safety certificate or the safety authorisation in accordance with Commission Regulation (EU) No 1158/2010 (9) or Commission Regulation (EU) No 1169/2010 (10), a national safety authority shall accept accreditation or recognition by a Member State in accordance with Article 7, as proof of the ability of the railway undertaking or infrastructure manager to act as an assessment body. 2. When granting the certificate to an entity in charge of maintenance in accordance with Regulation (EU) No 445/2011, the certification body shall accept such accreditation or recognition by a Member State, as proof of the ability of the entity in charge of maintenance to act as assessment body. recognition by a recognition body designated by the Member State of the ability of an entity in charge of maintenance, an organisation or a part of it or an individual to conduct independent assessment. 2. When the Member State recognises the national safety authority as an assessment body, it is the responsibility of that Member State to ensure that the national safety authority fulfills the requirements set out in Annex II; In this case, the assessment body functions of the national safety authority shall be demonstrably independent of the other functions of the national safety authority. 1. In the cases referred in Article 9(1)(a) and (d) and Article 9(2), the period of validity of recognition shall not exceed 5 years from the date it is granted. the period of validity of recognition shall be limited to the validity of the safety certificate or authorisation under which it is granted. In this case, the request of recognition shall be made at the next application for renewal or update of the safety certificate or authorisation. the period of validity of recognition shall be limited to the validity of the certificate issued by the certification body under which it is granted. In this case, the request of recognition shall be made at the next application for renewal or update of that certificate. 1. By analogy to the requirements in Article 5(3) and (4) of Regulation (EC) No 765/2008 for accreditation, the recognition body shall conduct periodic surveillance in order to verify that the assessment body it recognised continues to satisfy the criteria set out in Annex II during the validity of the recognition. 2. If the assessment body no longer satisfies the criteria set out in Annex II, the recognition body shall limit the scope of application of the recognition, suspend or withdraw the recognition, depending on the degree of non-compliance. Where the risk assessment for a significant change is not to be mutually recognised, the proposer shall appoint an assessment body meeting at least the competency, independency and impartiality requirements of Annex II. The other requirements of paragraph 1 in Annex II may be relaxed in agreement with the national safety authority in a non-discriminatory way. 1. Where applicable, by no later than 21 May 2015, Member States shall inform the Agency which is their national accreditation body and/or recognition body or recognition bodies for the purposes of this Regulation, as well as of the assessment bodies they recognised in conformity with Article 9(1)(a). They shall also notify any change to that situation within one month of the change. The Agency shall make this information publicly available. 2. By no later than 21 May 2015, the national accreditation body shall inform the Agency of the assessment bodies accredited, as well as of the area of competence for which those assessment bodies are accredited as provided for in points 2 and 3 of Annex II. They shall also notify any change to that situation within 1 month of the change. The Agency shall make this information publicly available. 3. By no later than 21 May 2015, the recognition body shall inform the Agency of the assessment bodies recognised, as well as of the area of competence for which those assessment bodies are recognised as provided for in points 2 and 3 of Annex II. They shall also notify any change to that situation within 1 month of the change. The Agency shall make this information publicly available. 1. The Agency shall organise peer evaluations between the recognition bodies based on the same principles as set out in Article 10 of Regulation (EC) No 765/2008. 2. The Agency shall organise, in collaboration with the European cooperation for Accreditation (EA), training on this Regulation for the national accreditation bodies and for the recognition bodies at least at each new revision of this Regulation. 1. The assessment body shall provide the proposer with a safety assessment report in accordance with the requirements set out in Annex III. The proposer shall be responsible for determining if and how to take into account the conclusions of the safety assessment report for the safety acceptance of the assessed change. The proposer shall justify and document the part of the safety assessment report for which the proposer eventually disagrees. 2. In the case referred to in point (b) of Article 2(3), in accordance with paragraph 5 of this Article, the declaration referred to in Article 16 shall be accepted by the national safety authority in its decision to authorise the placing in service of structural subsystems and vehicles. 3. Without prejudice to Article 16 of Directive 2008/57/EC, the national safety authority may not request additional checks or risk analyses unless it is able to demonstrate the existence of a substantial safety risk. 4. In the case referred to in point (a) of Article 2(3), in accordance with paragraph 5 of this Article, the declaration referred to in Article 16 shall be accepted by the notified body in charge of delivering the conformity certificate, unless it justifies and documents its doubts concerning the assumptions made or the appropriateness of the results. 5. When a system or part of a system has already been accepted following the risk management process specified in this Regulation, the resulting safety assessment report shall not be called into question by any other assessment body in charge of performing a new assessment for the same system. Mutual recognition shall be conditional upon demonstration that the system will be used under the same functional, operational and environmental conditions as the already accepted system, and that equivalent risk acceptance criteria have been applied. Based on the results of the application of this Regulation and on the safety assessment report provided by the assessment body, the proposer shall produce a written declaration that all identified hazards and associated risks are controlled to an acceptable level. 1. The railway undertakings and infrastructure managers shall include audits of the application of this Regulation in their recurrent auditing scheme for the safety management system as referred to in Article 9 of Directive 2004/49/EC. 2. The entities in charge of maintenance shall include audits of the application of this Regulation in their recurrent auditing scheme for the system of maintenance as referred to in Article 14a(3) of Directive 2004/49/EC. 3. As part of the tasks defined in Article 16(2)(e) of Directive 2004/49/EC, the national safety authority shall supervise the application of this Regulation by railway undertakings, infrastructure managers and the entities in charge of maintenance that do not fall within the scope of Regulation (EU) No 445/2011 but are identified in its National Vehicle Register. 4. As part of the tasks defined in Article 7(1) of Regulation (EU) No 445/2011, the certification body of an entity in charge of maintenance of freight wagons shall perform surveillance of the application of this Regulation by the entity in charge of maintenance. 1. Each infrastructure manager and each railway undertaking shall, in its annual safety report referred to in Article 9(4) of Directive 2004/49/EC, report briefly on its experience with the application of this Regulation. The report shall also include a synthesis of the decisions on the level of significance of the changes. 2. Each national safety authority shall, in its annual safety report referred to in Article 18 of Directive 2004/49/EC, report on the experience of the proposers with the application of this Regulation, and, where appropriate, its own experience. 3. The annual maintenance report of entities in charge of maintenance of freight wagons referred to in point I(7)(4)(k) in Annex III to Regulation (EU) No 445/2011, shall include information about the experience of entities in charge of maintenance in applying this Regulation. The Agency shall gather this information in coordination with the respective certification bodies. 4. The other entities in charge of maintenance that do not fall within the scope of Regulation (EU) No 445/2011 shall also share their experience with the Agency on the application of this Regulation. The Agency shall coordinate the sharing of experience with these entities in charge of maintenance and with the national safety authorities. 5. The Agency shall collect all information on the experience of the application of this Regulation and shall, when necessary, make recommendations to the Commission with a view to improving this Regulation. an analysis of the overall effectiveness of this Regulation. The national safety authorities shall support the Agency in collecting such information. Regulation (EC) No 352/2009 is repealed with effect from 21 May 2015. It shall apply from 21 May 2015. Done at Brussels, 30 April 2013. (2) OJ L 108, 29.4.2009, p. 4. (3) OJ L 237, 24.8.1991, p. 25. (4) OJ L 191, 18.7.2008, p. 1. (5) OJ L 122, 11.5.2011, p. 22. (7) OJ L 235, 17.9.1996, p. 6. (8) OJ L 110, 20.4.2001, p. 1. (9) OJ L 326, 10.12.2010, p. 11. (10) OJ L 327, 11.12.2010, p. 13. (11) OJ L 153, 14.6.2007, p. 9.
management of all identified hazards and the associated safety measures. This risk management process is iterative and is depicted in the diagram of the Appendix. The process ends when compliance of the system with all the safety requirements necessary to accept the risks linked to the identified hazards is demonstrated. The risk management process shall include appropriate quality assurance activities and be carried out by competent staff. It shall be independently assessed by one or more assessment bodies. The proposer in charge of the risk management process shall maintain a hazard record in accordance with point 4.
the risk assessment methods or tools are required by a TSI or comply with publicly available recognised standards specified in notified national rules. Without prejudice to civil liability in accordance with the legal requirements of the Member States, the risk assessment process shall fall within the responsibility of the proposer. In particular the proposer shall decide, with agreement of the actors concerned, who will be in charge of fulfilling the safety requirements resulting from the risk assessment. The safety requirements assigned by the proposer to those actors shall not go beyond the scope of their responsibility and domain of control. This decision shall depend on the type of safety measures selected to control the risks to an acceptable level. The demonstration of compliance with the safety requirements shall be conducted in accordance with point 3. The first step of the risk management process shall be to identify in a document, to be drawn up by the proposer, the different actors’ tasks, and their risk management activities. The proposer is responsible for coordinating close collaboration between the different actors involved, according to their respective tasks, in order to manage the hazards and their associated safety measures. Evaluation of the correct application of the risk management process falls within the responsibility of the assessment body. For each interface relevant to the system under assessment and without prejudice to specifications of interfaces defined in relevant TSIs, the rail-sector actors concerned shall cooperate in order to identify and manage jointly the hazards and related safety measures that need to be handled at these interfaces. The management of shared risks at the interfaces shall be coordinated by the proposer. If, in order to fulfil a safety requirement, an actor identifies the need for a safety measure that it cannot implement itself, it shall, after agreement with another actor, transfer the management of the related hazard to the latter in accordance with the process set out in point 4. For the system under assessment, any actor who discovers that a safety measure is non-compliant or inadequate is responsible for notifying it to the proposer, who shall in turn inform the actor implementing the safety measure. The actor implementing the safety measure shall then inform all the actors affected by the problem either within the system under assessment or, as far as known by the actor, within other existing systems using the same safety measure. When agreement cannot be reached between two or more actors it is the responsibility of the proposer to find a solution. When a requirement in a notified national rule cannot be fulfilled by an actor, the proposer shall seek advice from the relevant competent authority. Independently from the definition of the system under assessment, the proposer is responsible for ensuring that the risk management covers the system itself and its integration into the railway system as a whole. The risk assessment process shall interact with hazard management in accordance with point 4.1.
assumptions that determine the limits for the risk assessment. A hazard identification shall be carried out on the defined system, in accordance with point 2.2.
an explicit risk estimation (point 2.5). In accordance with the principle referred to in point 1.1.5, the assessment body shall refrain from imposing the risk acceptance principle to be used by the proposer. The proposer shall demonstrate in the risk evaluation that the selected risk acceptance principle is adequately applied. The proposer shall also check that the selected risk acceptance principles are used consistently. The application of these risk acceptance principles shall identify possible safety measures that make the risk(s) of the system under assessment acceptable. Among these safety measures, those selected to control the risk(s) shall become the safety requirements to be fulfilled by the system. Compliance with these safety requirements shall be demonstrated in accordance with point 3. The iterative risk assessment process is considered to be completed when it is demonstrated that all safety requirements are fulfilled and no additional reasonably foreseeable hazards have to be considered. The proposer shall systematically identify, using wide-ranging expertise from a competent team, all reasonably foreseeable hazards for the whole system under assessment, its functions where appropriate and its interfaces. All identified hazards shall be registered in the hazard record in accordance with point 4. To focus the risk assessment efforts upon the most important risks, the hazards shall be classified according to the estimated risk arising from them. Based on expert judgement, hazards associated with a broadly acceptable risk need not be analysed further but shall be registered in the hazard record. Their classification shall be justified in order to allow independent assessment by an assessment body. As a criterion, risks resulting from hazards may be classified as broadly acceptable when the risk is so small that it is not reasonable to implement any additional safety measure. The expert judgement shall take into account that the contribution of all the broadly acceptable risks does not exceed a defined proportion of the overall risk. During the hazard identification, safety measures may be identified. They shall be registered in the hazard record in accordance with point 4. The hazard identification only needs to be carried out at a level of detail necessary to identify where safety measures are expected to control the risks in accordance with one of the risk acceptance principles referred to in point 2.1.4. Iteration may be necessary between the risk analysis and the risk evaluation phases until a sufficient level of detail is reached for the identification of hazards. identification of the deviations from the code of practice or from the reference system. The proposer, with the support of other involved actors, shall analyse whether one, several or all hazards are appropriately covered by the application of relevant codes of practice. Upon request, they must be available to assessment bodies for them to either assess or, where relevant, mutually recognise, in accordance with Article 15(5), the suitability of both the application of the risk management process and of its results. Where compliance with TSIs is required by Directive 2008/57/EC and the relevant TSI does not impose the risk management process established by this Regulation, the TSIs may be considered as codes of practice for controlling hazards, provided requirement (b) of point 2.3.2 is fulfilled. National rules notified in accordance with Article 8 of Directive 2004/49/EC and Article 17(3) of Directive 2008/57/EC may be considered as codes of practice provided the requirements of point 2.3.2 are fulfilled. the use of the codes of practice shall be registered in the hazard record as safety requirements for the relevant hazards. Where an alternative approach is not fully compliant with a code of practice, the proposer shall demonstrate that the alternative approach pursued leads to at least the same level of safety. If the risk for a particular hazard cannot be made acceptable by the application of codes of practice, additional safety measures shall be identified by applying one of the two other risk acceptance principles. an independent assessment in accordance with Article 6. The proposer, with the support of other involved actors, shall analyse whether one, several or all hazards are appropriately covered by a similar system that could be taken as a reference system. it is used under similar environmental conditions as the system under assessment. these safety requirements shall be registered in the hazard record as safety requirements for the relevant hazards. If the system under assessment deviates from the reference system, the risk evaluation shall demonstrate that the system under assessment reaches at least the same safety level as the reference system, applying another reference system or one of the two other risk acceptance principles. The risks associated with the hazards covered by the reference system shall, in that case, be considered as acceptable. If at least the same safety level as the reference system cannot be demonstrated, additional safety measures shall be identified for the deviations, applying one of the two other risk acceptance principles. If the hazards are not covered by one of the two risk acceptance principles laid down in points 2.3 and 2.4, the demonstration of risk acceptability shall be performed by explicit risk estimation and evaluation. Risks resulting from these hazards shall be estimated either quantitatively or qualitatively, taking existing safety measures into account. The acceptability of the estimated risks shall be evaluated using risk acceptance criteria either derived from or based on requirements contained in Union legislation or in notified national rules. Depending on the risk acceptance criteria, the acceptability of the risk may be evaluated either individually for each associated hazard or the combination of all hazards as a whole considered in the explicit risk estimation. If the estimated risk is not acceptable, additional safety measures shall be identified and implemented in order to reduce the risk to an acceptable level. If the risk associated with one hazard or a combination of several hazards is considered acceptable, the identified safety measures shall be registered in the hazard record. For technical systems where a functional failure has a credible direct potential for a catastrophic consequence, the associated risk does not have to be reduced further if the rate of that failure is less than or equal to 10–9 per operating hour. Without prejudice to the procedure specified in Article 8 of Directive 2004/49/EC, a more demanding criterion then the one laid down in point 2.5.4 may be requested, through a notified national safety rule, in order to maintain a national safety level. In the case of additional authorisations for placing in service of vehicles, the procedures of Articles 23 and 25 of Directive 2008/57/EC shall apply. If a technical system is developed by applying the 10–9 criterion laid down in point 2.5.4, the principle of mutual recognition is applicable in accordance with Article 15(5). Nevertheless, if the proposer can demonstrate that the national safety level in the Member State of application can be maintained with a rate of failure higher than 10–9 per operating hour, this criterion may be used by the proposer in that Member State. the results shall be sufficiently accurate to serve as robust decision support. Minor changes in input assumptions or prerequisites shall not result in significantly different requirements. 3.1. Prior to the safety acceptance of the change, fulfilment of the safety requirements resulting from the risk assessment phase shall be demonstrated under the supervision of the proposer. 3.2. This demonstration shall be carried out by each of the actors responsible for fulfilling the safety requirements, as decided in accordance with point 1.1.5. 3.3. The approach chosen for demonstrating compliance with the safety requirements as well as the demonstration itself shall be independently assessed by an assessment body. 3.4. Any inadequacy of safety measures expected to fulfil the safety requirements or any hazards discovered during the demonstration of compliance with the safety requirements shall lead to reassessment and evaluation of the associated risks by the proposer in accordance with point 2. The new hazards shall be registered in the hazard record in accordance with point 4. Hazard record(s) shall be created or updated (where they already exist) by the proposer during design and implementation until acceptance of the change or delivery of the safety assessment report. A hazard record shall track the progress in monitoring risks associated with the identified hazards. Once the system has been accepted and is in operation, the hazard record shall be further maintained by the infrastructure manager or the railway undertaking in charge of the operation of the system under assessment as an integrated part of its safety management system. The hazard record shall include all hazards, together with all related safety measures and system assumptions identified during the risk assessment process. It shall contains a clear reference to the origin of the hazards and to the selected risk acceptance principles and clearly identify the actor(s) in charge of controlling each hazard. All hazards and related safety requirements that cannot be controlled by one actor alone shall be communicated to another relevant actor in order to find jointly an adequate solution. The hazards registered in the hazard record of the actor who transfers them shall only be regarded as controlled when the evaluation of the risks associated with these hazards is made by the other actor and the solution is agreed by all concerned. 5.1. 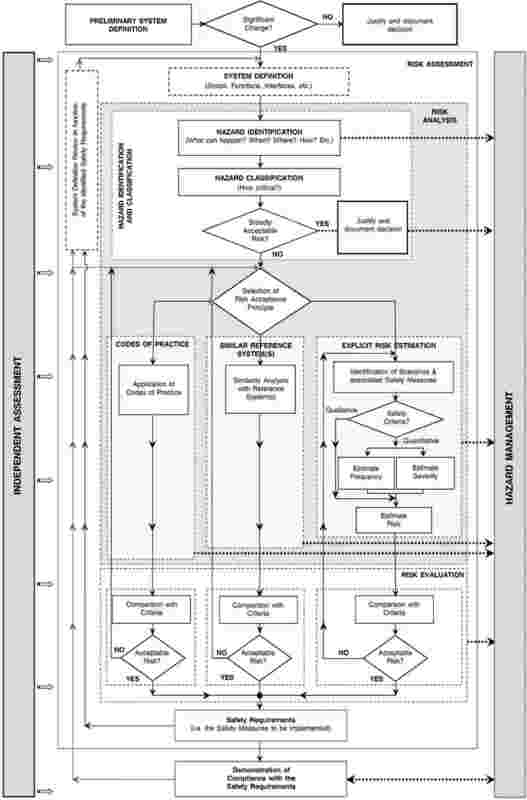 The risk management process used to assess the safety levels and compliance with safety requirements shall be documented by the proposer in such a way that all the necessary evidence showing the suitability of both the application of the risk management process and of its results are accessible to an assessment body. all assumptions relevant for system integration, operation or maintenance, which were made during system definition, design and risk assessment. 5.3. The assessment body shall establish its conclusion in a safety assessment report as defined in Annex III. competence in the correct application of safety and quality management systems or in auditing management systems. By analogy to Article 28 of Directive 2008/57/EC concerning the notification of notified bodies, the assessment body shall be accredited or recognised for the different areas of competence within the railway system, or parts of it for which an essential safety requirement exists, including the area of competence involving the operation and maintenance of the railway system. the technical aspects necessary for assessing the relevance and completeness of risk assessments and the level of safety for the system as a whole. The assessment body may be accredited or recognised for one, several or all of the areas of competence listed in points 2 and 3.
the conclusions of the independent assessment.